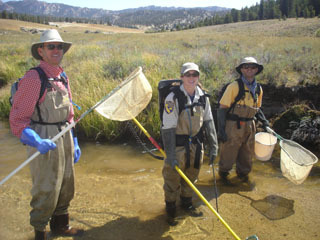 The Golden Trout project is a collaborative effort to protect and restore the California Golden Trout. 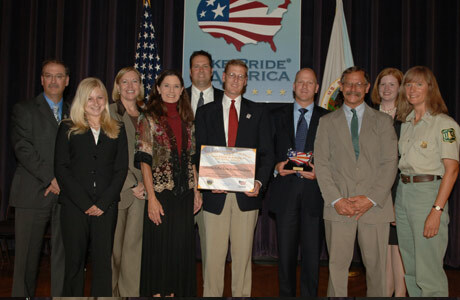 It is organized by the California Department of Fish and Game (CDFG) and the U.S. Forest Service (USFS) with assistance from Trout Unlimited (TU), California Trout (CalTrout) and the Federation of Flyfishers (FFF). 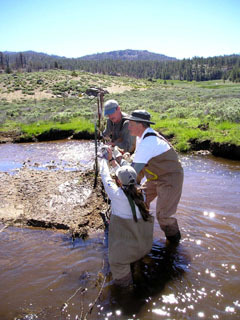 Every summer and fall there are a variety of opportunities for volunteers to participate in the restoration and monitoring activities that will take place in Inyo and Sequoia National Forests and Sequoia-Kings Canyon National Parks in the southern Sierra. All of the volunteer opportunities involve significant outdoor activity and some involve rigorous backpacking and/or hiking in the high country. In all cases volunteers will have to provide their own transportation to the starting points of the trips and their own camping, fishing, outdoor gear, and food. Before filling out the form make sure you have read the project descriptions and planned activities to determine which volunteer opportunity best suits your interests. Then take a moment to fill out this form (remember, first come, first served). Please note: If you participate in any activities you will be required to sign a liability waiver form and a CDFG Volunteer Service Agreement. 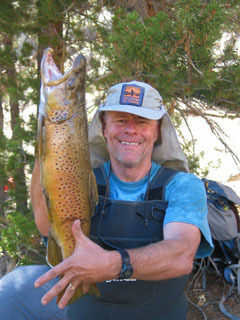 If you are going to fish, a current CA Fishing license is required as well. We will take care of all other required permits. Please submit a separate registration sheet for each family member or each individual in your group. Backpack Trips: In past years, we have had mules available for carrying everyone’s personal gear as well as a large group camp set-up and hearty home-cooked meals. This year, because of budget limitations, we have to cut back on the number of mules and therefore, the weight and volume of our food and gear. Food (weight) and camp amenities will be reduced to more of a backpacking-style set-up. Volunteers will be required to carry in their own camping gear and sometimes their food in their personal backpacks. No personal gear will be sent on the mules. On some trips we will be able to plan food and cooking as a group and have the mules pack it in, but it will be lightweight and mostly non-perishable. On other trips, everyone will have to bring and carry their own food, stoves and cookware. See each trip description below regarding the food and kitchen arrangements. Activity: Help the Inyo National Forest maintain a new electric fence in upper Mulkey Meadow to protect the stream from cattle damage. Volunteers will backpack, bringing all of their own food and gear, 3.5 miles from Horseshoe Meadow at 9942' elevation, over Mulkey Pass at 10380' to the campsite at 9500'. Volunteers should meet USFS personnel at the Horseshoe Meadow Parking Lot at 9am on Tuesday July 5th (start hiking around 10am). What to bring: All of your own food, backpacking, camping and fishing gear. Some pack mule support may be available. A detailed list and trip itinerary will be provided to confirmed participants. This Monache Meadow trip has been cancelled. The jeep road heading into the meadow being washed out and is unpassable for any vehicles. The trip will NOT be rescheduled for this year. The October trip has not been cancelled and will still occur as scheduled. Activity: Help maintain the fence at the DFG wildlife area and the USFS Olivas pasture to keep the cattle out and protect the habitat along the South Fork of the Kern River and Monache Creek. Pot luck and barbecue Saturday night (meat and homemade ice cream provided by the CDFG). Plan on driving into the meadow Friday evening, a full workday and potluck dinner on Saturday, and a half day of work on Sunday. Early morning and afternoon fishing for golden trout and brown trout on the South Fork of the Kern. What to bring: Volunteers need to bring their own food, including a contribution for the potluck, and your own camping equipment. Be prepared for very cold nights and warm days. Wear long pants, long-sleeved shirts and eye protection (sunglasses). Bring leather work gloves, pliers, and a VHF radio, if you have them. All other tools will be provided. The road into Monache requires four wheel drive with high clearance. We will coordinate car pooling in an effort to minimize the number of vehicles needed. Carpool space is often limited so if you have an appropriate four wheel drive vehicle, please offer to drive. Volunteers: 12 person limit. Volunteers with four wheel drive vehicles will receive preference due to the high clearance driving requirements. Activity: Repair the Bullfrog Crossing in Mulkey Meadows from previous work completed in 2007. It will involve working with stone to build a stream crossing along the trail to ensure that the meadow and stream characteristics are not degraded by traffic from recreational use. Masonry skills will be emphasized as we construct a stone crossing with steps leading into the creek and out the other side. We will focus on maintaining and enhancing the meadow characteristics at the stream crossing that will provide good fish habitat well into the future for the Golden Trout. Volunteers will need to be in good condition for hiking and vigorous working at altitudes over 10,000 feet. Volunteers will meet at Horseshoe parking area on the morning of the 19th. Camping gear will be packed in by mules to the worksite, about five miles in from the trailhead. 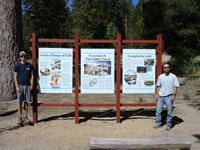 Volunteers and Inyo Forest employees will camp and work in Mulkey Meadows area until Friday, September 23rd. We will hike back out to the trail head while the mules carry the gear. Dinners will be provided and the other finer details will be worked out as volunteers are signed up. There are some good holes for fishing, and if we get done early in the days, there will be opportunities for exploring this beautiful area. What to bring: Volunteers need to bring their own food, including a contribution for the potluck, and your own camping equipment. Be prepared for very cold nights. Bring neoprene waders (if you have some), work gloves and pliers, all other tools will be provided. Volunteers will be contacted and informed of any changes to the trip itinerary. The specific times and meeting places will be communicated to every volunteer that has signed up for an activity. The need for flexibility of schedule is important on some of these trips. We will do everything possible to communicate specific times and locations to all volunteers in a timely fashion. Location note: All activities will take place in the Sierra Nevada Mountains at elevations ranging from 7,000 up to 12,000 feet. The weather is usually warm days with potentially very cold nights and sometimes rain or snow. A good sleeping bag and rain gear is critical. For these high-elevation trips altitude sickness is a possibility so being well-rested, well-hydrated and becoming acclimated to the altitude prior to the trip by camping at the trailhead are essential. Forms: It is required that every volunteer register for all of these activities. It is also important, in the event you have committed to a trip and your plans change, that you let us know if you will not be able to attend. A tremendous amount of planning goes into these trips and there are people on waiting lists. It will also be necessary to fill out several forms, including special release forms for the time you are working on the project. BE SURE TO SIGN UP EARLY IN ORDER TO ENSURE YOUR PARTICIPATION IN A SPECIFIC ACTIVITY. 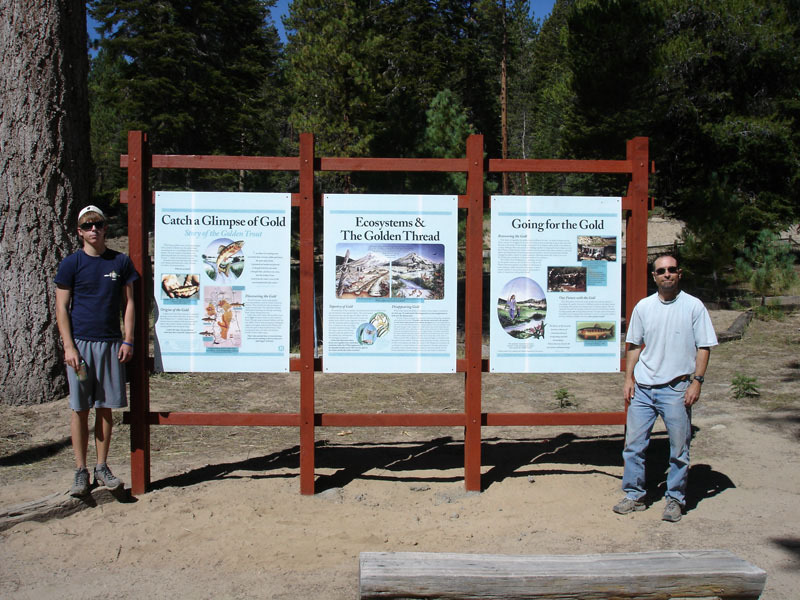 Background information and a poster of the Golden Trout. 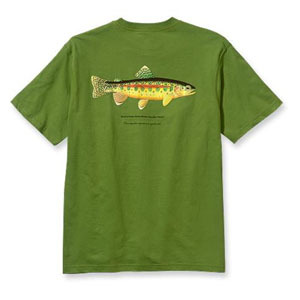 These Golden Trout T-shirt from Patagonia are sold out. Five dollars from each purchase was donated to the Golden Trout Project. Thank you for your support and a big thank you to Patagonia for supporting California’s State Fish! This website maintained by Kona Earth. Have you ever dreamed of quitting your high pressure job, leaving the city and moving to a tropical island? The Strawn family actually did it. Their Kona coffee farm is an estate farm which means the coffee is in their direct control from planting to packaging. Visit www.KonaEarth.com to see pictures, read about life on the farm and have some fresh 100% Kona coffee shipped directly to you.